« A Mystery Loatian Fruit: can anyone identify it? Pear Rust: what can I do to protect my trees? A pear tree in my garden is showing symptoms of what I believe is pear rust. The characteristic orange/brown leaf spots first appeared on half a dozen leaves on the Williams’ Bon Chrétien in summer last year and the affected leaves were promptly removed. This summer they have reappeared. Two neighbouring pear trees, Conference and Doyenne du Comice, seem at present to be unaffected. I understand that juniper trees are also a host for this disease. My neighbour has a number of juniper trees in her garden. Is my Williams therefore doomed to recurrent/permanent infection? Is this variety particularly susceptible to pear rust or are the Conference and Comice also likely to succumb sooner or later? As it sounds like you’re in an urban spot, your neighbours are probably not the only ones with a host plant in the area, so it’s probably unproductive to focus on this. Are you in or around London by any chance? 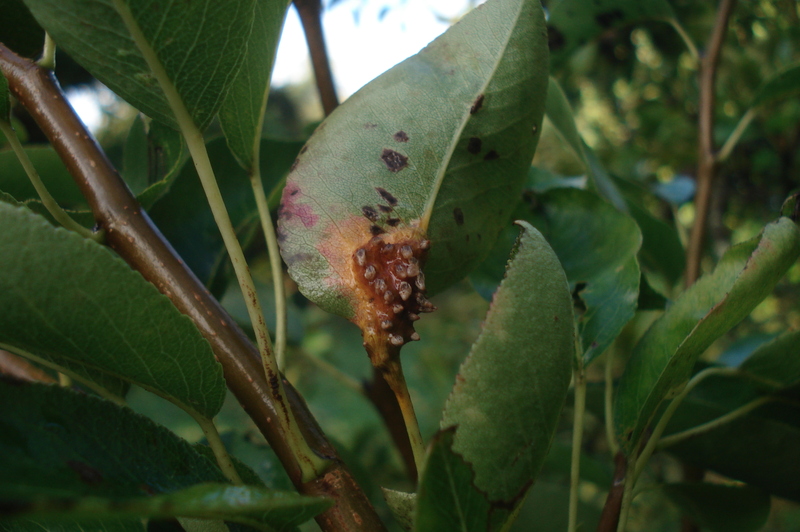 It is a hotspot for pear rust. Good tree health is key to fighting diseases. A healthy tree should be able to fight diseases, but a stressed tree is less capable of fending them off and succumbs. The fact that you only have a few leaves with rust on them suggests that you’re actually doing all right, as I’ve seen trees absolutely covered in it this year, all the leaves and fruit too; it’s a very poor year for it. However, if you think your trees might be struggling a little, try a regime of mulching and improving the water resource around the tree if it looks fairly dry at the base. Make sure it’s not competing with any other plants for resources. Any crowded parts in the crown should be thinned out to allow good air flow throughout the tree. Remove as many of the infected leaves as you find and put them straight in the dustbin or burn them. You might have to cut out cankers in the bark in winter. Do a Google Images search ‘pear rust bark canker’ for example so you know what to look for. You could probably put waste in the municipal compost bin if you have one as the heat of their composting destroys any diseases. Fastidiously clear any dropped leaves from under the tree when the leaves drop. You can get a fungicide that helps with this problem. Spot treat with a myclobutanil based fungicide (I think Bayer Systhane is the only option available to us non-farmers). A good dose all over in spring before bud-burst, and again after is how to treat some fungal infections, but I’m not certain this is the correct procedure for rust with systhane (always read the label!). These sites give some good information and the RHS asks the public to report incidents. on November 4, 2012 at 11:49 am Adrian Baggaley. Last year there was no pear rust that I can remember, which I presume was due to the previous very bad winter. This year it is everywhere, and in my orchard the worst that I have ever known. I have been picking off leaves all season. Provided the ‘fangs’ on the underside of the leaf are not near to sporulating, I drop them to the ground. My neighbour has ornamentals and it is reasonable to assume there may be the odd Juniper among them. I have found that a programme of Systhane sprays for scab in spring, starting early April curtails rust activity one hundred per cent. Any later than this and the spray is ineffective. Severe infection can affect the following years fruit crop. Thank you for this detailed advice. I am not in London but on the North Kent coast, just outside Whitstable, in a small residential area. I think one of the problems I may have is that the tree is old and not in the best of health – part of the trunk was rotting when we moved here 25 years ago, so it is probably doing well to be still producing fruit.. Although the crown is kept fairly open the tree is growing in grass near a hedgerow so has competition for water; this would not have been helped by our recent dry summer. As we’ve now had a lot of rain, I will mulch it and take the extra hygiene precautions that you suggest, although I am loath to apply any chemical fungicides. I am in Cambridge and again my recently purchased pear tree has this bright orange rust! Thanks for all the great information I will remove the leaves that have it. I have two pears, Beth and Beurré Hardy. I have only had them for three years and this is the first year I’ve seen pear rust. It’s devastated the Beurré Hardy tree which had been moved, to a better area, but I did let the grass grow up around the base. The other was also moved but there was no grass at the base and it has done better with little signs of rust. My neighbour’s very large Conference pear tree is decimated but it is never pruned and crowded by an apple and the house. The owner never lets anything grow at the base but the repeated digging to keep away weeds might not help. I too would rather avoid using any chemicals on it so will give it one more year then if it there’s no improvement I’ll graft it over to quince or even hawthorn! I’m in County Durham. I live in Bath and have a fairly young Conference Pear – about 3 years old. This is the first year I have had a crop of pears from it, but in pruning it I found the bright orange-red spots of Rust with the strange little legs on the underside, a bit like a caterpillar’ feet. I have removed all the affected leaves and thinned the whole plant for more air to circulate. Is it too late now (September) to treat it? Should I wait until Spring? I don’t know of anyone around here growing Juniper. If no Juniper, will the Rust not survive the Winter? Thank you for all the helpful comments. My pear tree is 45yrs old and this year the leaves got rust spots. What can I do? The tree is huge! I have 3 pear trees. Found there are orange spots on the leavers. What to do; lots of branches are dead?? No leaves at all could you help? Planted a 2 year old Conference pear last winter, noticed the pear rust late summer and have removed affected leafs. Next doors mature pear I notice is affected. Maybe a cold winter would help? I’ve been told not to take off all the leaves or the tree will suffer. Means it will have 3 leaves left. Shall I just give up? My lovely wall covering Doyenné du Comice is covered in brown spores. Think it happens on even numbered years! That is spores go off and find a Juniper host each alternate year. Will try Bayer Garden Systhane Fungus Fighter in the Spring. Westland Plant Rescue Fungus is also, I believe recommended. Such an eye-sight at the moment. What do you mean, it’s an eyesight? As for even years, mine is last consecutive 4 years. I planted a Conference Pear Tree 5 years ago, and the leaves are absolutely covered in Pear Tree Rust. Last year we had a fantastic crop of fruit, this year hardly any. What treatment can be used and when. 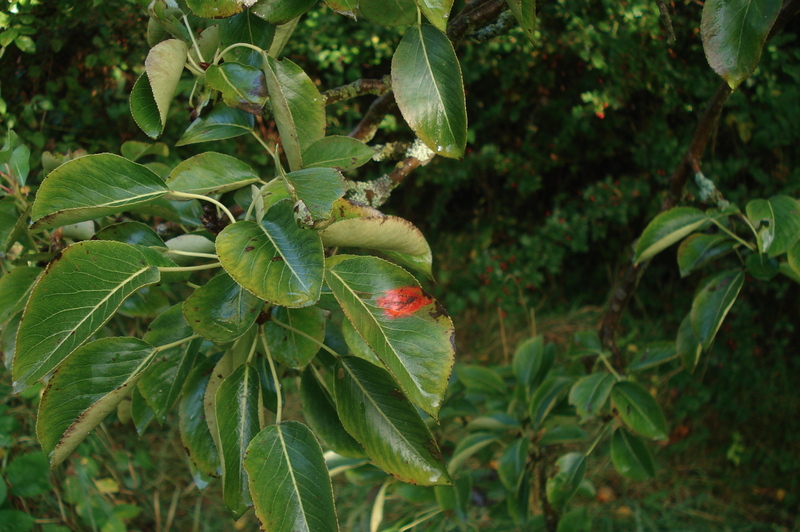 The leaves are showing warty developement of Pear Tree Rust gall.